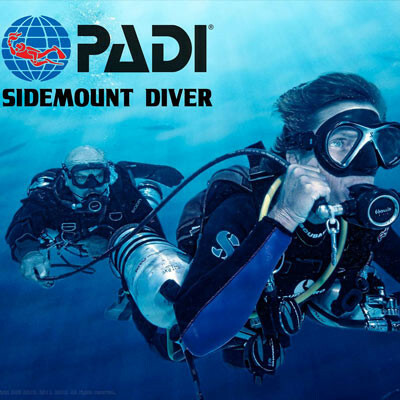 Take the PADI Sidemount diver specialty and experience some of the benefits of sidemount diving like reduced drag, better buoyancy, which leads to lower air consumption and join the future of diving! Also it’s perfect for traveling since the equipment is less bulky and heavy to than normal equipment.You will learn to dive with 2 tanks, one tank on each side of your body with stand alone first stage and regulators and SPG’s. Which means more air and longer dives, perfect for photographers and people with high air consumption. The course consists of Theory, Equipment setup and adjustment, one Pool session and 3 Open water dives in one of Bali’s most spectacular and famous dive site area. , equipment adjustment as a preparation for next coming days open water dives, possibly additional pool practice if needed. There are no hidden costs, this price covers everything: Equipment, PADI material, certification fee, lunches during training, snacks, soft drinks, hotel pick up and drop of, last but not least a very dedicated and experienced Instructor. Equipment: We are today using the Hollis SMS50 for all recreational sidemount courses and the Apeks Tec regulator set.